Before the age of fluorocarbons and exotic esthers, link a man used to scrub his bar of shaving soap into a lather with one of these, daub it on his face and shave. I gave this to Dad for Christmas a few years ago, and he sent it along last month in a boxful of HLOs he generously lent to the cause (yes, I’ll be mailing most of them back). Chromed brass, by the way it’s corroding. I don’t think he uses it much. Before the age of fluorocarbons and exotic esthers, help a man used to scrub his bar of shaving soap into a lather with one of these, daub thge resulting suds onto his face and shave. 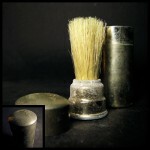 Before the age of fluorocarbons and exotic esthers, more about a man used to scrub his bar of shaving soap into a lather with one of these, daub it on his face and shave. Chromed brass, and little used, by the way it’s corroding. 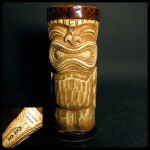 The Aku-Aku Restaurant opened in 1960 inside the much-fabled Stardust Casino in Las Vegas. The Aku Aku ran for 20 years.=, a veritable temple of tiki culture (Here’s its appetizer menu). I don’t know whether this fellow is laughing or grimacing, but he’s the real deal – a rough-hewn head in wonderfully scratchy ceramic. He’s now living in a place of honor, among the other shrunken heads.